The epic battle that none of you have asked for! i love you, mr. gerads. 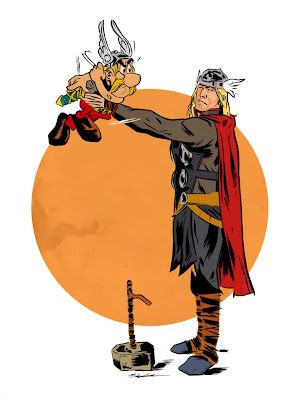 Thor's face is priceless buddy, and Asterix scrambling around there is hilarious. Nice touch with the Saturday Evening Post circle behind them too. I'm with Hawthorn. There's no sense in even trying this week. Game, Set and Match to Mr. Gerads. Haha, When I saw these comments I actually spit some of my cherry limeade out. YOU GUYS OWE ME CHERRY LIMEADE! Thanks, guys! Though I hardly think the game is set or matched.